I went to bed last night wishing the Socceroos well and hoping to wake this morning to hear the unlikely news that we had made it through. In the way of these things I found myself stirring around game time and in my dozy sleep shifting between strange soccer related dreams and wondering outright how they were progressing. I checked the score on the iPhone by my bed – 0-0 – but that still wasn’t enough. I knew I couldn’t rest while I still wondered, and so I got up. I turned the TV on in time to see the second half. It was cold even with Rigby snuggling against me, so I threw a rug over me as I watched the game in far off South Africa. What’s to say? 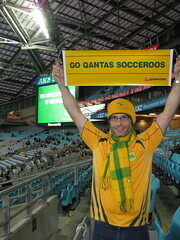 We didn’t qualify, but the Socceroos did us proud. Within 4 minutes of each other we scored two excellent goals to Cahill and Holman, and though Serbia got a consolation goal late thanks to a Schwarzer goal we won the game 2-1. Though Germany beat Ghana in Johannesburg it was not enough. We were level second in the group with Ghana, but missed out on goal difference. Though it was no surprise it is disappointing. The performance overnight vindicated the spirit of the team, but unfortunately it’s the dreadful performance against Germany that finished us. Outside of that game we were the next best team, but that’s not enough. You can’t exclude results you don’t like. Ghana is the incredibly lucky qualifier. They lost to Germany, drew with us and beat Serbia. They scored two goals in the whole phase and they were both penalties for opposition hand balls. On both occasions their opponents were reduced to ten men. They are the sole African nation left in it. Where to from here? For Australia it’s a time to rebuild, and a time to learn from our mistakes. Most of the team won’t be around in four years time. Valeri and Holman, both good in this tournament, should be central players – Holman might be a cracker. Cahill will probably be there, and Wilkshire on the fringes. That’s about it. Time to try new blood – the Oars and Leckie’s and Langeraks. The lesson to be learned is that we must play to our strengths. To this point in our development they have been strength, athleticism and spirit. Hopefully we will add some technical skills to that. Most particularly we have to give proper consideration to the Australian ethos as I have been saying for yonks. Our native sports are hard and aggressive. With ball in hand we attack the goal or the line; without the ball we attack the man in possession. There is no zoning off in our sports. It’s either active offence or active defence. Sitting on our heels and being reactive goes against the national grain. Though Verbeek was a great exponent of the Australian spirit he never really understood this. His deficiencies became team deficiencies: conservative, reactive, and, above all, inflexible. These are foreign attributes to Australian sporting teams, and it is revealing that only when the team was released from those shackles – when there was no other choice – did the team flow and look dangerous. We itch to have a go, and chafe when we are forbidden too. Verbeek is gone now. Soon there will be a new coach. I would hope we will find someone more attacking. Whilst we should not be proscriptive on team structure – that has to be flexible enough to manage different situations – the FFA should make it clear to the new coach that there are certain requirements. Foremost amongst them is that we play attacking football. Not only is it our nature, it’s important for the development of the game here. In it’s infancy still an attractive style will draw fans; and it is the best way to learn. Word is that the French coach Le Guin (who coached Cameroon) is the front runner. It makes a break from the Dutch influence we have previously favoured. I think the Dutch style suits us, it certainly did when Hiddink was in command. I like the sound of Rijkard or Gullit, both heard in dispatches, but wonder if it is too early to be moving on a new coach. It seems sensible that we should wait until the World Cup is done – there will be ample coaches available then. Time will tell. We’re out, but we went out fighting. Like I said, can’t ask for more than that. As for the rest of the tournament? I think it might be a South American final. Pending injuries and red cards Germany and Argentina look likely to meet in a Semi Final. Whoever wins that wins the cup. This entry was posted in Sports and tagged Australia national association football team. Bookmark the permalink.